The 2015 She Leads Conference was held on 18-19 May 2015 at Hotel Realm. Our MC Tracey Spicer, and a lineup of renowned Australian women leaders led a day of education and skills development, an abundance of networking opportunities, and a mix of stimulating talks and hands-on workshops. 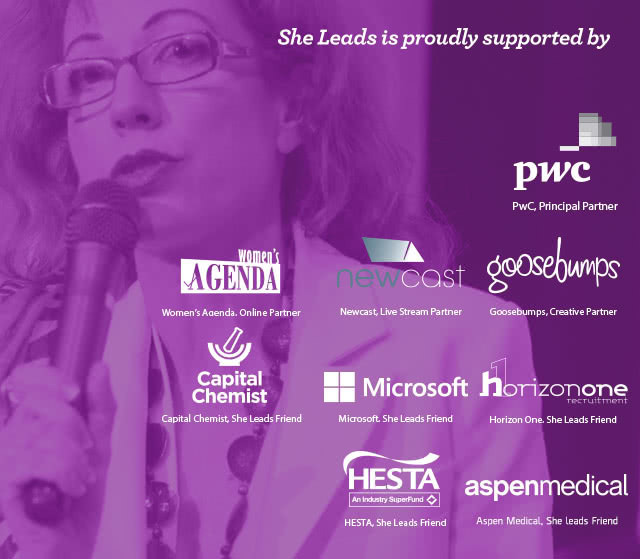 Attending the She Leads Conference gave delegates the practical skills to accelerate their leadership journeys, whether they work in the corporate, government or not-for-profit sector. The event is designed to be an intergenerational event and we welcomed and encouraged women of all ages and at all stages of their leadership journey to attend. This year the Conference also included exciting She Leads Masterclasses, which were held in the evening of 18 May at Hotel Realm. The Masterclasses were run concurrently. Find out about the Masterclass program and our fabulous facilitators. We welcome applications from members and non-members. By becoming a She Leads partner, you are demonstrating your support for advancing gender equality in Australia. You will join like-minded organisations and businesses from a range of sectors and industries in empowering women to achieve their full potential. For further information please refer to the She Leads Partnership Guide. To discuss opportunities for your organisation to become a She Leads Partner, contact Joanna Allebone, Director of Corporate Relations and Communications at Joanna.le@ywca-canberra.org.au.